The goal is sympathy; we want you to consider their feelings. They’re individuals as much as your colonists. Slaughter if you will (and that’s where the game pushes you right now due to lack of other combat challenges), but we’re starting to provide some more serious structure and consequences for combat — for your soldiers who are carrying out the violence in particular. 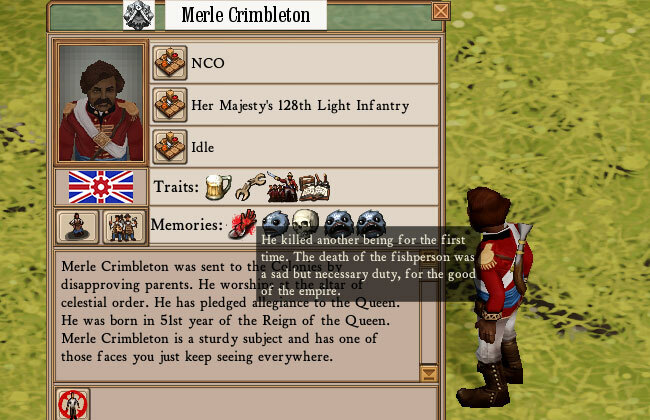 In Clockwork Empires, doing violence and witnessing violence takes a psychological toll; it creates memories, and a soldiers will create memories with different interpretations of the events they witnessed based on their personality traits. A brutish xenophobe will happily gun down Fishpeople all day – though what will that make them eventually remains to be seen – while a more poetical, mild-mannered type who happens to be a soldier will have some second thoughts. Killing for the first time is more upsetting than the second. Killing a human is more upsetting than killing a fishperson (unless one is, as they say, a bit fishy). The effects of consequences rippling out from actions to create more consequences is what Clockwork Empires is all about and as we dig deeper we’re enabling this to happen more and more. There’s some really cool work being done and some really cool stuff going in to the game. It is a pleasure to watch people explore the little details and discover what we’ve snuck in to the game to make their life as a Colonial Bureaucrat a little more difficult – and a little more interesting. First pass at almost-zero draw overhead (AZDO) pass (as described in last week’s blog post). Enable this in your config.xml if you want to try it; not done, use at your own risk. To enable, change <entry key=”azdo” type=”int” value=”0″ /> to <entry key=”azdo” type=”int” value=”1″ />. THIS PROBABLY DOESN’T WORK ON AMD CARDS. If you’ve opted in to the experimental build, let us know how it’s going! Fishmen will have water guns which squirt all sorts of horrible fluids at people, won’t they? Those clothing rips and tears bear a deep and significant cultural meaning too complex for our simple, non-aquatic brains. Also, curious: How unenthusiastic, exactly, would The Empire be about This Sort Of Thing? More of a ‘This doesn’t seem proper!’ level of discourse or a ‘BURN IT DOWN’ sort of thing? This depends, perhaps, on how far you take This Sort Of Thing and how much of a Fuss is made by Those Inclined To Write Letters To The Empire Times to bring attention to This Sort Of Thing. Having reached this culminating event in his life, Daniel moved to a cottage in the country and life a quiet and content life far from the things of man, tending his small edibles garden and thinking fondly of that day, those berrybushes, their doubled chance of exhaustion, before lying down to sleep sated dreams in the warm summer breeze and rural noises wandering into his cozy room. Will the Empire be able to make those too? It has plenty of street urchins, doesn’t it?